...Take me out to the ball game....buy me some peanuts and crackers jacks...of course, we have em' in this design! That and much more! 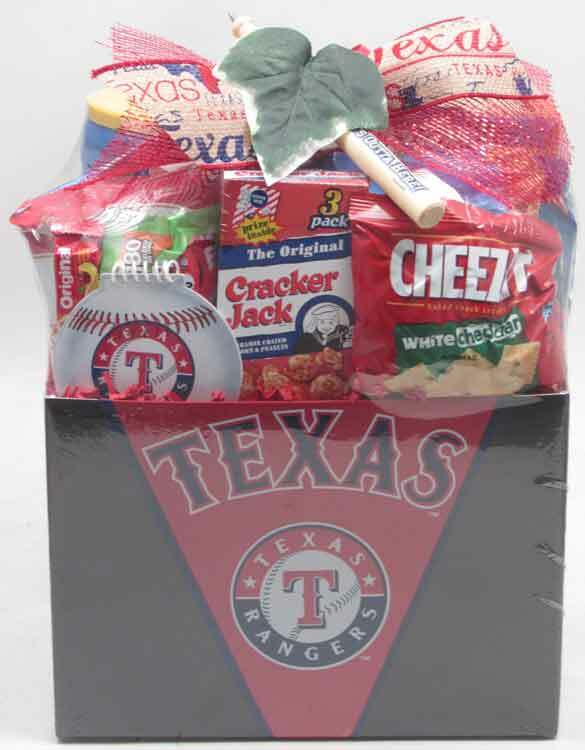 Includes Texas Rangers trademark plastic Banner and a MLB Bat Pen to write down all of those important stats in! Also included is a mini Soft Baseball to squeeze to ease the stress during the game! 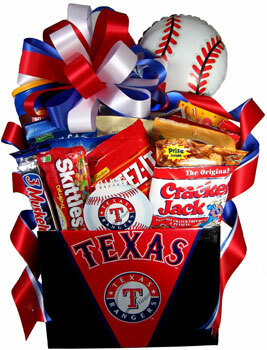 Assortment of Potato Chips/Snacks, Candies, Chocolate Bars, Snack Crackers, Cookies, Cracker Jacks, and lots of Snacks! Wrapped in crisp clear cellophane, approximately 21" high x 12" wide x 6" deep. For shipping, it will be designed lower in the container, will be shrink-wrapped and a smaller bow will be included. Includes a Handwritten Greeting Card. NOTE: This particular 9" baseball balloon and the baseball notepad are no longer being manufactured. The contents above will be in the design, which includes a wooden baseball bat pen and a mini soft baseball that aren't in the photo.